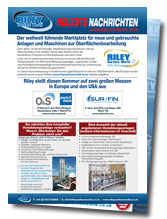 Every day, Riley Surface World acquires used surface technology plant and machinery covering the entire spectrum of the industry, from manual polishing lathes to complete electroplating plants. 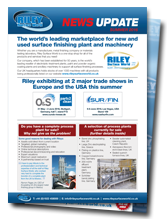 Three times a year, we publish the popular Riley's News Update newsletter. 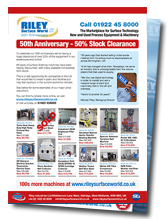 This is distributed with Surface World magazine in the UK and across Europe. 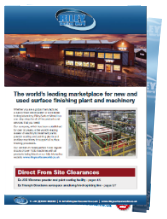 It is also mailed to our large database of companies that are involved in surface finishing, from small workshops to multi-national manufacturing organisations. Registering your details will allow you to access the electronic version of the newsletter in a convenient format for printing or to quickly browse for machines and offers you may be looking for. Register your details by clicking on the register link below. OR, complete our enquiry form to receive a free printed copy in the post. Click on a cover below to view one of our past issues.